如果對 unix 系統的 ps 顯示的資訊不熟悉, 可以參考這一篇. 在 Wine(可在 Linux or 其他 POSIX Unix下執行 Winodows 的軟體)執行各家 Benchmark 的比較. Wine 在許多數據都比 Windows 來得好, 主要還是 3D 的部份比較差. 目前來說, 用我的 X31 跑這些 Software 其實很順暢. 11/29 真是熱鬧, 除了 KDE 3.5 Released . Firefox 1.5 也出了. 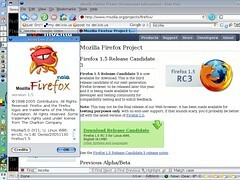 照例, 等 Firefox 1.5 進 Gentoo portage 系統以後, 再來換吧. 第一次 emerge 時, 升級後怪怪的, 重新再 emerge 一次就正常了. 這是怎麼樣, 網站被塞爆了嗎? 我要上個 COPYURL 的 PATCH, 連 source code 都抓不下來………. 之前寫了一篇寫 Blog 時，貼圖片的好幫手, 這邊有改了 COPYURL 的做法. 不知道作者上了 patch 了沒有. 今天 KDE 3.5 正式 Release 了.
kopete 將 video/audio 的 Protocol 包進去了, 也就是說可以用 webcam . 新增了自動撥放的功能, 就是 OOXX Device 塞進電腦, 就會跳一個視窗問你, 要做什麼.